Race cars built for 500 bucks and thrashed on a tough endurance course for hour after hour tend to develop a few problems. OK, they develop many problems! At this race, we've seen some normally bulletproof machines fall apart, while the Italian contingent (four Alfa Romeos and a Fiat) have proven completely trouble-free. The failure of a tiny hose in the Paraguayan Mercedes-Benz S600 knocked the car out of the action for most of Saturday. The team was able to get a replacement hose, but had to remove approximately 10,000 oddball fasteners in order to access its hiding place beneath the intake manifold. Betcha this is a $15,000 repair at your local Benz shop! The car managed to get back onto the track late in the afternoon, and proved to be so slow and unwieldy that most of the People's Curse talk has died down. Would you believe that "V12" is not necessarily synonymous with "fast?" The Angry Hamster Racing Magna V65-powered Honda Z600 turned out to be quite fast on the track... right up to the moment at which they started having problems with the gears in their snazzy CNC-machined direction-reversing gearbox. They lost some time on Saturday, but have returned to the action. 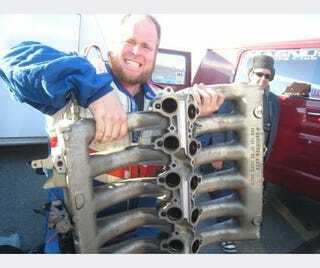 These Saab racers have done their best to carry on the LeMons Saab tradition of burning holes in their cylinder heads. Hope the local junkyards have another one! The casualty rate among the Nissan Z contingent appears to be approaching 100%, with an epidemic holes in blocks, busted clutches, and impossible-to-diagnose electrical woes bringing tears to the eyes of Nissan lovers everywhere.